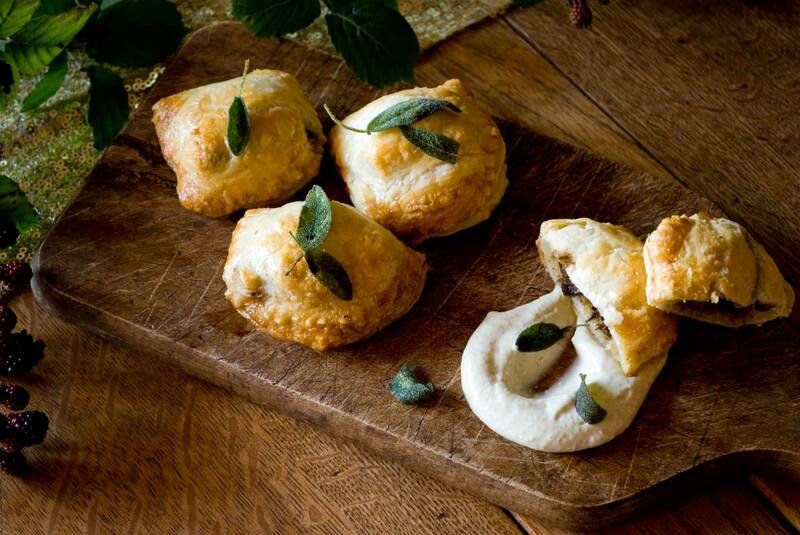 These delicious little wild mushroom and pastry puffs are wickedly moreish and the perfect vegetarian alternative to a sausage roll. The sage mayo that is served with them is deceptively easy to make and compliments the earthy flavours of the mushrooms perfectly. A great little snack to add to your party food repertoire. These little puffs are great for entertaining as you can make up a batch well in advance and store in the freezer until needed. They will not need defrosting before cooking either, just pop in the oven at 170°C (fan) for approximately 20 -25 mins until crisp and golden on the outside. Remember to brush the pastry with beaten egg before placing in the oven to ensure you get a beautiful golden crust. For presentation purposes, and of course additional flavour, I like to adorn the puffs with crispy sage leaves. These are really simple to make, taste delicious and look beautiful. Heat 25g butter in a small pan and drop in a handful of sage leaves (try and select the smaller ones if possible). Allow the leaves to cook in the butter for approx. 4 minutes until the butter starts to brown and the leaves turn a darker shade of green. Carefully remove the sage and leave to drain on kitchen paper; they will crisp up as they cool. The first stage is to roast the garlic. The recipe only calls for 5 cloves but it is easier to roast as a whole bulb. Any leftovers can be spread over hot toast and then smothered with brie, used to make a delicious garlic butter or simply tumbled on top of a juicy steak. Cut the top off a bulb of garlic and drizzle the insides generously with olive oil. Add a pinch of salt and wrap the bulb up tightly in tin foil before placing on a baking tray. Pop in the oven at 160°C (fan) for approx. 40 – 50 minutes until soft. The cloves can be easily removed once the garlic is cool enough to handle. Next soak the dried mushrooms. Place them into a bowl and pour over just enough boiling water to cover them. Leave for 20 minutes until soft. Strain away any excess liquid, finely chop and set aside. While the dried mushrooms are soaking prepare the shallots and chestnut mushrooms by finely chopping them and adding to a pan with some butter, oil and a generous pinch of salt. Cook over a low heat on the hob until the onions are soft and translucent. Once the above three stages are complete add these elements (remembering you only need 5 cloves of roasted garlic) to a clean bowl along with the cream cheese. Using a wooden spoon mix everything until well combined. Finely chop the chives and add these to the mushroom and cheese mix along with a generous squeeze of lemon and some pepper. Mix once again, give it a little taste and add more seasoning and lemon juice if required. The next step is to roll the mix into a sausage shape (approx. 3cm in diameter). The easiest way to do this is by spooning the mixture onto some Clingfilm and then rolling it up on your kitchen work top to form a sausage. Once rolled, secure it either end and then pop in the freezer for at least 2 hours to firm up or overnight. Once firm, cut the mushroom sausage into 1cm discs and then in to half-moons. Working quickly, as the pastry is impossible to use if it gets too warm, lightly flour a work surface and lay out your ready rolled puff pastry. With a rolling pin gently roll it out in order to achieve a slightly larger, thinner rectangle of pastry. Once rolled cut the pastry in half, length ways. Working with one piece of pastry at a time, place one mushroom half-moon on one side, just in from the edge. Place the next mushroom half-moon about 1 ½ cm along from the first. Continue until you have a neat row. Next crack an egg into a bowl and whisk. With a small brush (or using your finger) egg wash the pastry surrounding the mushrooms. Then fold the side of the pastry sheet that doesn’t have mushroom on it over the top of the mushrooms and seal with your forefinger. Once sealed cut in between each mushroom puff until you have individual puffs. Repeat this process with the second portion of pastry. Make sure each puff is well sealed by pushing down on the edges gently with a fork. If you are cooking straight away, pop the puffs on to a baking tray and in to the freezer for 20 minutes to firm up. If you are making these in advance place them in an air-tight container and store in the freezer until needed (see hints and tips section). The puffs will take about 15 – 20 minutes to cook. Pre-heat the oven to 170°C (fan) and brush the tops of the puffs with the remaining beaten egg. Cook until golden and crisp on top. These are best served warm but are also delicious cold. Place the sage leaves into a small food processor with a generous pinch of salt and blitz until finely chopped. Next add the mayonnaise, a generous drizzle of extra virgin olive oil and a squeeze of lemon juice. Blitz again until everything is combined. Check the seasoning and add more salt or lemon as required. As well as the sage mayo I like to serve these with some crispy sage leaves for added texture and additional flavour. See the hints and tips section for how to prepare these.